Devices connected to AWS IoT are represented by IoT things in the AWS IoT registry. The registry allows you to keep a record of all of the devices that are registered to your AWS IoT account. On the Welcome to the AWS IoT Console page, in the navigation pane, choose Manage. On the You don't have any things yet page, choose Register a thing. On the Create a thing page, in the Name field, type a name for your thing, such as MyIotThing. Choose Next. We do not recommended using personally identifiable information in your thing name. On the Add a certificate for your thing page, choose Create certificate. This generates an X.509 certificate and key pair. Choose Download for your certificate. Choose Download for your private key. Choose Download for the Amazon root CA. This will display a new web page. Choose RSA 2048 bit key: Amazon Root CA 1. This opens another web page with the text of the root CA certificate. Copy this text and paste it into a file named Amazon_Root_CA_1.pem. Most web browsers save downloaded files into a Downloads directory. You will copy these files to a different directory when you run the sample applications. Choose Activate to activate the X.509 certificate, and then choose Attach a policy. On the Add a policy for your thing page, choose Register Thing. After you register your thing, you will need to create and attach a new policy to the certificate. On the AWS IoT console, in the navigation pane, choose Secure and Policies. Enter a Name for the policy, such as MyIotPolicy. For Action, enter iot:*. For Resource ARN, enter *. Under Effect, choose Allow, and then choose Create. This policy allows your device to perform all AWS IoT actions on all AWS IoT resources. These settings are overly permissive. In a production environment narrow the scope of the permissions to that which are required by your device. For more information, see Authorization. Choose Manage and then choose your AWS IoT thing. In the certificate detail page, choose Actions and then Attach policy. 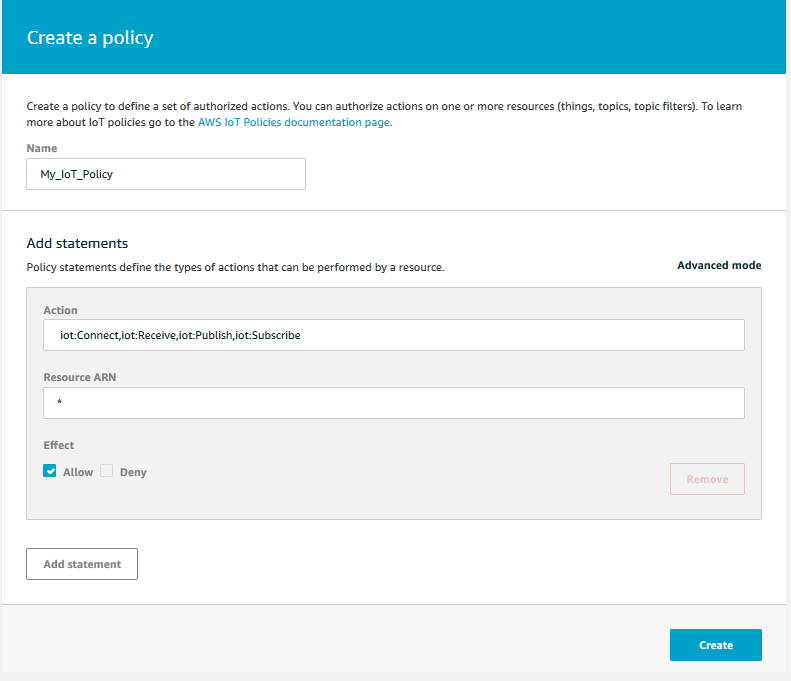 Choose the policy you created (MyIotPolicy) and choose Attach.